Leasing Available from $63.82 per month! Looking for Dell B5465DNF Parts? 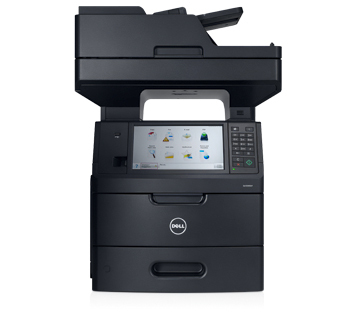 Print, copy, fax and scan for large workgroups with the DellTM B5465dnf Multifunction Printer, featuring fast printing, inbox solutions and advanced security features. 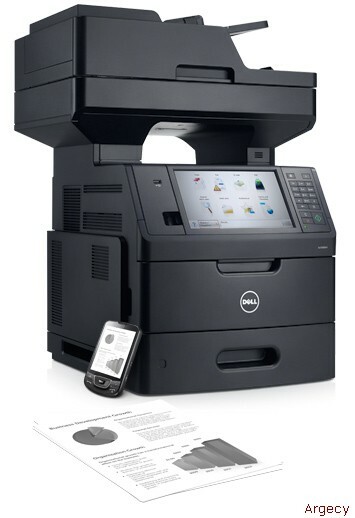 Blazing fast printing of up to 70 pages per minute (ppm) (letter), 66 ppm (A4). Built in Duplex Automatic Document Feeder allows you to scan two-sided documents at up to 72 sides per minute (spm) (letter), 70 spm (A4). Low cost per page of US 1 cent per page with optional extra high yield toner. 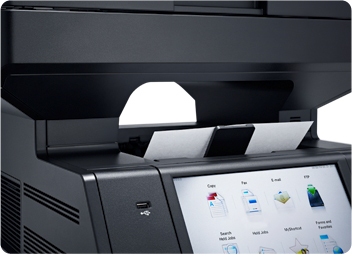 Super-fast printing of up to 70 pages per minute (ppm) (letter), 66 ppm (A4). Outstanding cost-per-page with optional extra-high-yield cartridge that prints up to 45,000 pages at one cent (US) per page. High duty cycle of up to 300,000 pages per month to help meet high-volume printing demands. Gigabit Ethernet connectivity and optional external wireless adapter that helps maximize data transmission speeds across your network. Help improve office efficiency with handy shortcuts and enhanced usability features offered by the B5465dnf Multifunction Printer. Scan two-sided documents at up to 72 sides per minute (spm) (letter), 70 spm (A4) with built-in Duplex Automatic Documents Feeder with dual-scan sensor. Scan documents and save digital files directly to email or to one of 30 folder destinations on the network. Easily scan and print both sides of an ID card, such as an insurance or business card, on one page with Card Copy. Quickly access and print frequently used forms stored on a website, an FTP site or in a network folder using the Forms and Favorites feature. Create up to 25 copy, fax and email shortcuts that are quickly accessible through the printer control panel. Add an optional 550-sheet input paper tray and a 2100-sheet high-capacity feeder with caster base to allow a maximum input paper handling of up to 3,300 sheets. Quickly enhance office imaging capabilities and help boost workforce efficiency with the easy automated manageability of the B5465dnf multifunction printer. Swiftly navigate menu and configuration settings with the intuitive 10.2" (25.9 cm) color LCD touch screen. Remotely access the printer control panel display with the Embedded Web Server (EWS) to modify settings, view printer status, release held print jobs and perform other print-related tasks. Help eliminate the clutter on your PCs with Dell Open Printer Driver (OPD), a single solution that can reduce the huge workload of driver deployment and setting changes. Monitor, manage and create reports for all Dell printers on your network with the Dell OpenManageTM Printer Manager (OMPM). Safeguard sensitive information without disrupting your printing capabilities with the powerful security features of the B5465dnf Multifunction Printer. 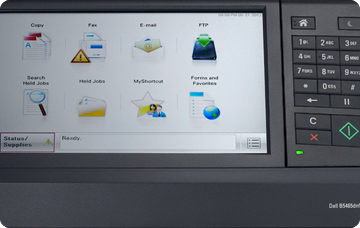 Help prevent restricted documents from collecting unattended in the output tray with Confidential Print, a valuable utility that holds jobs in the print queue until a PIN is entered at the printer display for secure printing and pickup. Help ensure data transmission security with support for SNMPv3 and IPV6 with IPsec authentication and encryption. Support WPA2 and 802.1X wireless security with optional wireless card. Control local and remote admission to specific menus, functions and workflows with security templates available through the B5465dnf access controls. Keep your downtime to a minimum and your business running to the maximum with outstanding support from Dell. Protect your investment even longer with an optional Limited Hardware Warranty extension of up to 5 years. And you can choose to simplify your printer environment with Dell ProSupport services, featuring options such as specialized technical support and expert onsite diagnoses.